Compare this 1914 model with the catalogue pictures below. Above you can see the catalogue picture for 1912 (price £28) and below for 1922 (£38). As to the front ‘guard, all post-1912 machines have the front guard extension; it is just that Marston never used a new picture, as is the case with the one of the lady emptying the oil-bath. I have restored both pre- and post-WW1 tricycles and all have had the long front ‘guard. I also checked the frame number sequences with him; I wasn’t sure if the tricycles numbers were concurrent. He confirmed: As you will know, the Sunbeam works records are presumed to have been lost. From the evidence obtained over the past 40 years or so, it seems that the tricycle and tandem numbers run concurrently, though I have no tricycle with an original receipt. 120766 is pre-war. The rear axle is an Abingdon No 4. 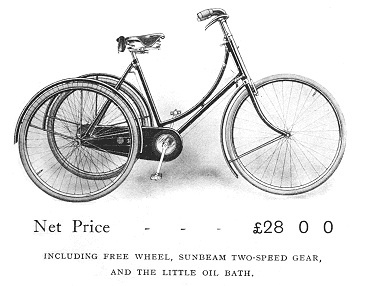 According to the text on the 1910 Brown Brothers catalogue below, the Abingdon No 4 axle had free wheel and back pedal brakes.